Epidaurus, a city-state of ancient Greece, is mostly known by its famous theater built around the end of fourth century before Christ. 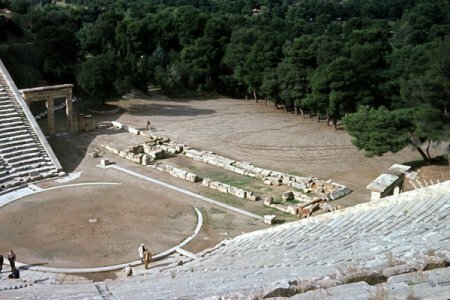 The architect of Theater at Epidaurus remains unknown. This theater, the most preserved of all ancient Greek theaters, seats about 14000 spectators. The Theater at Epidaurus was an inspiration to architect Luiz Paulo Cobra Monteiro, professor from College of Architecture and Urbanism at PUC-Minas, who developed a project for the open theater at Sao Jose do Rio Pardo, Brazil. The lightness of the stage covering was attained with the utilization of a tension structure. 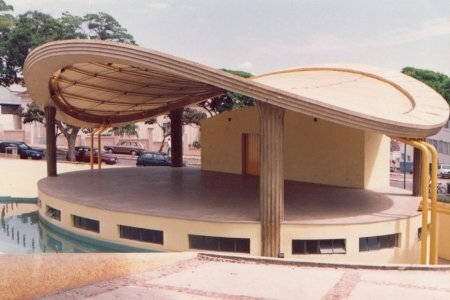 This structure was designed together with the engineers Luiz C. Almeida and Vinicius F. Arcaro, both professors from College of Civil Engineering at UNICAMP. A cable net, in the shape of a hyperbolic paraboloid surface before prestressing, forms the stage covering. The cable net is anchored in a reinforced concrete ring, whose axis projects an ellipse on the ground plane. The major and minor axis of the ellipse measure respectively 20.00 meters and 13.00 meters. A 10 x 6 orthogonal mesh, parallel to the axis of the ellipse, forms the cable net. The cross section of the edge ring is rectangular measuring 1.00 meter x 0.45 meter. The axis of the edge ring follows the shape of the hyperbolic paraboloid surface. Four reinforced concrete pillars, with height measuring 3.71 meters, sustain the edge ring.